This series of products displays the main functional types of benthic macroinvertebrates derived from a multivariate analysis of 13 life history traits. This series of products displays the main functional types of benthic macroinvertebrates derived from a multivariate analysis of 13 life history traits. Three main living modes were identified. The first one comprises species resistant to physical stress in natural conditions through a strong mobility, a short life cycle and a high offspring survival probability. The second one is composed of opportunistic species, also with a relatively short life span, among which many are pioneer species which are not very habitat-specific. The third group is composed of species which require many years or even decades to achieve a minimum of reproductive success. Population survival in the two first groups was shown to be unaffected by bottom trawling, whereas the response of the third species group is generally negative (ICES, 2017). 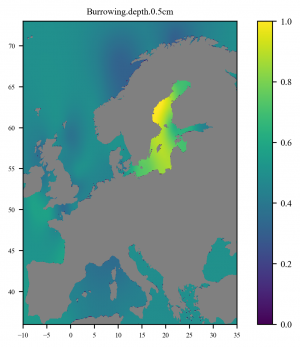 Hence, these products provide information on the benthic ecology, but also on ecosystem vulnerability to human pressures, but it must be noted that vulnerable organisms like corals and sponges, which frequently occur at boreal latitudes are not considered in this product. One representative species of each group illustrates this functional typology. Urothoe poseidonis is typical of the first group. 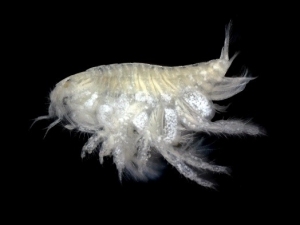 This is a small crustacean which is very abundant in coarse sediments subjected to high tidal velocities and shear stress, as encountered in the Southern Bight and on the Dogger Bank in the North Sea, and areas of northwestern France and southwestern UK with similar habitat characteristics. It has an annual cycle and releases a few large offspring as miniature-adults which become sexually mature only a few months later. 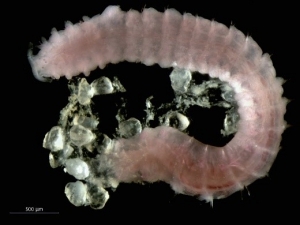 From the second group, Spiophanes bombyx is a small tubicolous worm which can cope with various environmental conditions, including constraining ones like oxygen depletion and salinity variation. 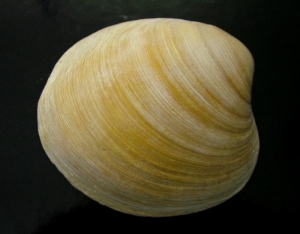 In the third group, Arctica islandica is a very iconic species, famous for its very long life span that exceeds hundred years and can reach five centuries. It matures and reproduces very late, at a large individual size which enables the production of a high number of small eggs. This large number compensates for the very high early mortality rates. Such a life cycle requires stable environmental conditions with low adult mortality. The very low metabolic rate of the species helps to survive naturally occurring stress from low food for prolonged periods. However, the species is very vulnerable to human disturbance causing direct adult mortality. Recovery from such disturbance is very slow. Complementary maps in the data product show the underlying data used to delineate the three major types discussed above. Each of the 13 life history traits used in the analysis had different modalities. In total, 62 trait modalities have been documented over the 13 traits. Maps have been produced displaying the scores for each of these 62 trait modalities, both based on absolute and relative organism densities averaged per spatial location. For example, the maps below show the relative proportion of the 4 burrowing depth modalities: 0 cm, 0 - 5 cm, 5 - 15 cm, > 15 cm. These maps are available for all traits. 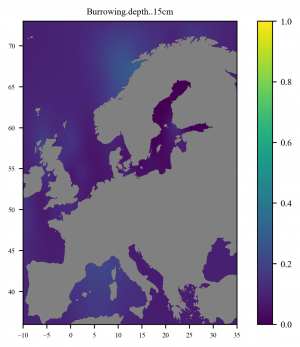 The map of the burrowing depth shows clearly that the burrowing depth in the Baltic is mainly at depths between 0 and 5 cm, this corresponds to the life traits of the resistant living mode (first group), see maps below. The map below shows the distribution data of the three living modes. A DIVAnd interpolated map of the relative distribution of the three living modes, indicating that the areas with the highest number of vulnerable species are the Greater North Sea or the French Mediterranean coast. Firstly, the different occurrence lists were merged, and the validity of taxonomic names was checked with the World Register of Marine Species (WoRMS). Two measures were considered per geographic location: individual organism density and number of taxa, in two separated data frames. Individual organism counts were summed per combination of location, sampling gear, sampling surface area, year, month and taxon. Sampling effort per location and sampling gear was calculated by summing the sampling surface areas of the different samples (when a location was sampled several times) and divided by the number of sampling times. 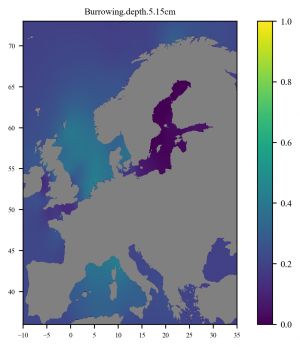 This enabled the calculation of individual organism densities per sampling gear and per location, and finally per location (expressed in number of individuals per squared meters). The number of taxa per location was calculated by successive averaging, firstly per combination of sampling gear, sampling surface area, year and month; then, per combination of sampling gear, sampling surface area and year, and so on until finally averaging per location.